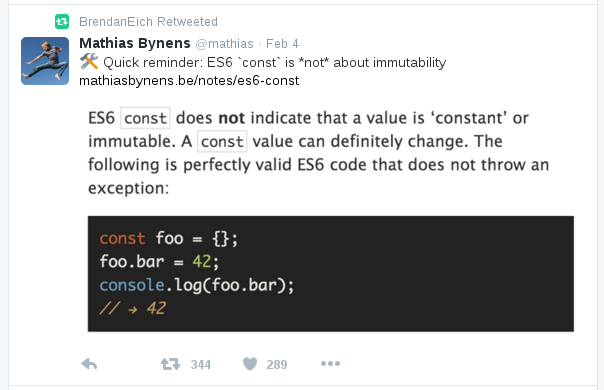 Design Notes: Why isn’t System.Array.length an ‘unsigned int’? It makes sense, doesn’t it? Array sizes should be unsigned because they can never be negative. Yet, JS++ chose to make System.Array<T>.length return a signed 32-bit integer (int). We’ve discussed this internally, and the underlying reasons are not so simple. Just know that I brought the proposal forward internally for indexing arrays as unsigned int, but I shut down my own proposal after the self-realization that it would break indexOf and lastIndexOf — it was just unacceptable. Java doesn’t have unsigned integer types. I actually feel like this can be a good design decision in some ways. It makes reverse array iteration intuitive and obvious: just flip the logic for forward random-access iteration around. Likewise, in C#, List<T>.Count returns a signed integer (32-bit). Just as in Java, reverse iteration with a for loop is just flipping the logic around. Of course, this won't work for C/C++ because, on the final iteration, you get integer overflow. So you initialize to the length of the array (without subtracting 1) and i --> 0 is better formatted as (i--) > 0. Thus, inside the loop body, you will only access - at most - length - 1 and it will count down until zero. However, this isn't intuitive unless you come from a C/C++ background, and most C/C++ programmers are not web developers. Oh, and int is just so much more pleasant to type than unsigned int with casts everywhere. Author Roger PoonPosted on November 19, 2017 November 19, 2017 Categories Design Notes, JS++1 Comment on Design Notes: Why isn’t System.Array.length an ‘unsigned int’? Today I want to talk about GLR parsing and the internals of the JS++ parser. 1. A comparison operation: Foo is less than bar is greater than baz. Optional (nullable) types will be coming to JS++. This usually stokes fears of null pointer dereferencing. For example, in Java, this is known as a “NullPointerException”. However, it’s possible to have nulls in a language without ever having NullPointerExceptions. By checking that foo is not null, we can guarantee foo is at least an instance of class Foo – thus making it very straightforward for us to check that the bar method exists. This is a process known as type refinement. What’s interesting is that the compiler is able to actually ensure you’ve made the check before you ever run your program. It achieves this by examining the control and data flow. This is cutting-edge research known as flow-sensitive type systems. null is a first-class type in the JS++ type system so, combined with JS++’s sound type system, JS++ is able to categorically determine that you’ve checked foo is non-null without ever executing any code. The enlightened few will use void 0 in place of undefined because the ECMAScript 3 standard defines undefined as a global property that can be defined! JS++, on the other hand, makes undefined a keyword. void is then used as a type which represents both null and undefined. Finally, there have been informal plans for a JS to JS++ translator. This will handle those few instances where void 0 is used to mean undefined and such. These cases are easy to parse and identify, and it makes introducing such a breaking change fathomable. JS++ does not implement a const keyword. This was a design decision. // Changing the value of an existing property; once again, not "constant"
The variable x is declared as a constant using the const keyword. However, it very clearly is not constant (e.g. mathematical constants, which are typically our first exposure to constants). Where references are concerned, const does not actually create a “constant” and should thus be regarded as either a misnomer, and, in a worst case, should be disallowed as a matter of best practice in order to discourage semantic confusion and – consequently – bugs. Instead, JS++ uses the final keyword. final prevents any further assignments to a variable; in other words, this is the last and “final” assignment. Thus, while the reference can be modified, the actual variable is still referring to that same reference. It was a final reference, and the reference we were referring to cannot be changed. Simple semantics and functionally identical, but it can go a long way in complex projects. We made a design decision based on experience and observation in the hope that final will be better because it doesn’t necessarily encourage the “I just know what it does” attitude. When it does, they should already be familiar with how it works from Java – a correct, consistent, non-confusing, and – most importantly – safe expectation.